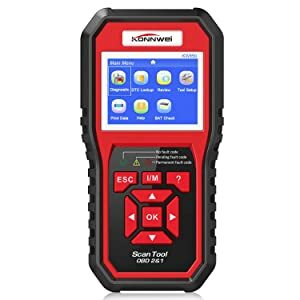 In this review, I will write about KONNWEI KW850, one of the best OBD2 Scanners in the market 2019. Konnwei OBD2 KW850 is a small adapter that makes finding the cause of the check engine light warnings or trouble codes become evidently much easier. 3.4 Who is KONNWEI KW850 for? Today, there’s a plethora of OBD2 sensor systems to pick from. What sets them apart is the functions and tasks they are able to perform. 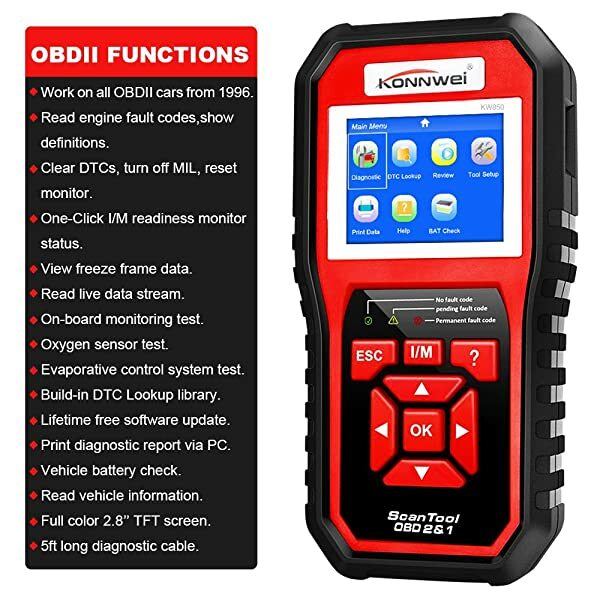 These gadgets are quite effective when it comes to diagnosing issues on modern cars, and the same with Konnwei OBD2 KW850. 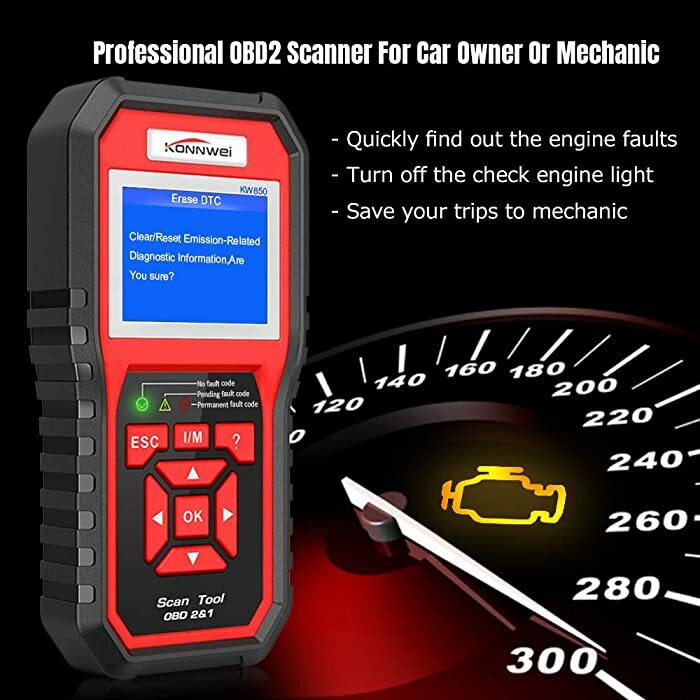 Konnwei OBD2 KW850 Scan Tool was developed in an attempt to help car owners diagnose their vehicle’s computer. You can simply connect it to your car’s diagnostic port, start the engine and scan for trouble codes. It is able to read its diagnostic data from this Konnwei hand-held device. Finding the cause of the check engine light warnings or trouble codes has evidently become much easier. This tool works on any car, light truck, hybrid, SUV or hybrid manufactured from 1996 to date. You also don’t have to be worried while working with this diagnostic tool. Can perform oxygen sensor tests on most OBD2 vehicles made in the USA. Extensive vehicle coverage; Excellent Basic Functions. Cons Possible compatible issues. Possible Trojan Viruses from the software. Cable is not durable; Possible compatibility issue. Possible issues with registration. Bottom Line KONNWEI KW850 is a great OBD2 Scanner for DIY. 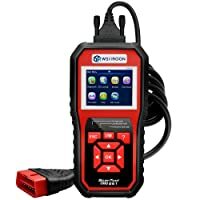 If you want an OBD2 Scanner with simple functions for reseting the check engine light, wsiiroon SR850 is built for you. Kzyee KC301 is another option for car owners who want to do simple tests and reseting the CEL on 12V cars and/or trucks. The KW850 Supports Full OBD2 Functions. The futuristic-looking Konnwei OBD2 KW850 scanner is effective in its functionality thanks to the following key features. The tool checks Oxygen (O2) sensor systems and reads On-Board Diagnostics (both OBD I and II) for American vehicles vehicle’s built since 1996. 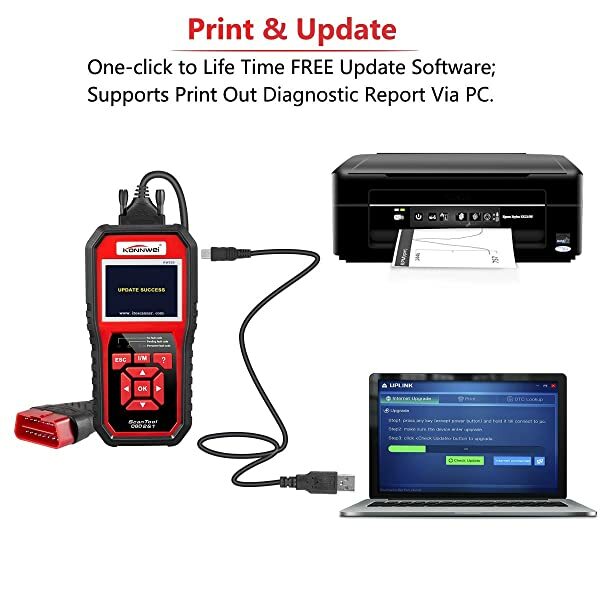 This gadget can access your manufacturers’ specific diagnostic codes (OEMs) in addition to generic diagnostic codes. It is better than the aftermarket codes and definitions other scanners provide. This tool can read and freeze, frame data. Frame data is the data recorded by a car in the event of an accident. The KW850 solves emission and checks engine light related trouble codes through its fix codes database. You can read the record and print real-time vehicle data with this tool. Monitors the battery voltage, temperature, and the engine’s r.p.m. You can also read and erase transmission and check engine light trouble codes, with just a push of a button. The Konnwei OBD2 KW850 works on both petrol and diesel passenger cars, SUVs, and light trucks, built after 1996. The device is compatible with all PC and Android systems except iOS. 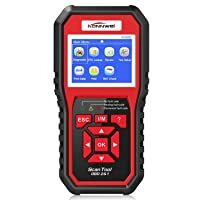 The Konnwei OBD2 KW850 has over 3000 built-in generic codes and a large database of code fixes that are certified by professional auto-mechanics. The package comes with a CD contains software for installation on your personal computer or laptop. With the software installed and the device connected via USB, you can always check for updates. The gadget’s software provides I/M key car readiness status and monitoring on a graphical view. The gadget also has detailed information concerning any vehicle, for example, it’s VIN (Vehicle Identification Number) and CID (Calibration Identification). KONNWEI KW850 has a lifetime FREE Update Software. Unique, ergonomic and compact design: Its great design makes it easy to hold in one hand. Excess voltage protection: You can check the performance and record live data as you drive. Compact, strong and durable: Its interface makes it simple for one to navigate without any complications. Supports Russian, English, Portuguese, Spanish, and several other foreign languages. Works on both petrol and diesel motor-vehicles. The gadget only works on American cars. It is not compatible with iOS devices. Who is KONNWEI KW850 for? KONNWEI KW850 is a Professional OBD2 Scanner for both car owners and enthusiasts. The Konnwei OBD2 KW850 offers both basic and professional scanning capabilities. This means it can be used by either car owners, DIYers, and car enthusiasts. You’ll be able to accurately determine the cause of the engine trouble codes and make the right repairs. Quality diagnostics and fix codes are a guarantee since the gadget is equipped with code fixes that have been thoroughly checked by experienced auto-technicians. You don’t have to lift the hood to check for your car’s diagnostics. By plugging in the Konnwei OBD2 KW850 to your OBD2 input port, you’ll receive the manufacturers’ specific and generic codes immediately. Yes, accessing your car’s computer is that easy. One of its outstanding features is its ability to read oxygen sensors. You’ll be able to notice when your car is having problems with its air intake pipes. 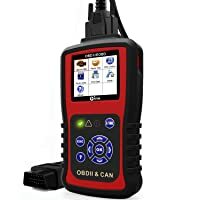 If you also want to obtain precise car diagnostic scans for either individual or professional use, then this is the go-to OBD2 scanner. 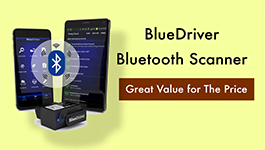 You won’t have to sacrifice durability or quality performance since this gadget will do the car’s diagnostics and oxygen scans with pin-point accuracy and clear all problematic codes. In this article, we’ll go over the basics of OBD2 scanners, the different types, and some specific models. Check it out NOW. Is the KW850 compatible with the Mercedes BenzML 350 2007 and the Audi, 4.2 V8, 2005? Yes but it wouldn’t work as perfectly as a scan tool that is built for Mercedes Benz. Ist der KW850 auch für einen Mercedes Sprinter 316 Bj:2016 kompatabel?